Precious metals continue to look very undervalued vis a vis most asset classes – particularly stocks and bonds. This is especially the case with silver which has fallen by more than 70% from what we believe was an intermediate price high of $49 in 2011 – despite surging demand for silver bullion coins and bars from canny buyers investing in silver. Silver is currently trading at just over $14.25 per ounce – 1/77th of the price of gold at $1,100/oz. GoldCore continue to believe that silver will surpass its non-inflation adjusted, nominal high of $50 per ounce in the coming years. Indeed, we believe that silver will surpass its inflation adjusted high or real record high of over $150 per ounce in the next 5 to 7 years. We are currently doing a research note on silver which will outline why we are so positive on silver. In the meantime, let us whet your appetite and give you an understanding of the rationale for our bullishness. Steve St Angelo of the SRSrocco REPORT has just done an excellent blog with three very interesting charts which contribute to our positive outlook for silver bullion. It is said that a tsunami announces itself when the ocean suddenly and for no apparent reason recedes back farther than anyone could imagine. Left stranded are everything from beachgoers to fishing vessels of all sizes and even marine wildlife suddenly exposed to the open air. The spectacle creates a dangerous curiosity which the naturally curious humankind has difficulty avoiding. There were many stories of similar behaviors in the biblically deadly 2004 Indian Ocean tsunami, as people at these beach destinations were stuck in place by the sheer nature of the event; to their own mortal peril. Well Zervos, I just got around to reading your 2015 year end QE love letter. Wow, too much of the 1985 Sassicaia or was it the Hibiki 30-year over an ice ball with a Behike 56?? Unfortunately as you awoke from your love potion induced haze you had to witness the worst start for markets of any year in US history. Now I’m not one to get in between two star crossed lovers David, but you and QE might want to rethink this relationship. The implication, of course, was that since no new recessions have started—- nor have any new wars been declared, polar glaciers melted or Wall Street banks gone down for the count——that the market’s worst ever start of the year was surely overdone. Maybe it was even BTFD time again. Then again, maybe the outlook is just as bad as it was before January 1st, but that the outlookers have acquired a new outlook. Stated more baldly, perhaps the sleepwalkers have finally awakened. That would certainly seem to be the case with the market’s high flyers. Most of this year’s spectacular flameouts have reported nothing new nor issued any disturbing 8-Ks. Amazon apparently had a swell Christmas, for example, but its share price is now down 19% from the bubblevision man’s line of demarcation. Manifest Destiny… terrorism… global warming – there is no idea so bogus it can’t be the cause of a government program or a massacre. Thoughts – like viruses – enter the brains of humans and take control of them. Then, acting as though they know what they are doing, people try to “improve” the world around them. They tax, kill, argue, torture, demonstrate, seize public land, write letters to the editor, and call up Rush Limbaugh. Ditto to that! Despite continued cuts in production and supply chain activity, inventory through November persists in great imbalance. With December retail sales demonstrating a Christmas sales season only worse in 2008 and 2009, that isn’t like to have changed. 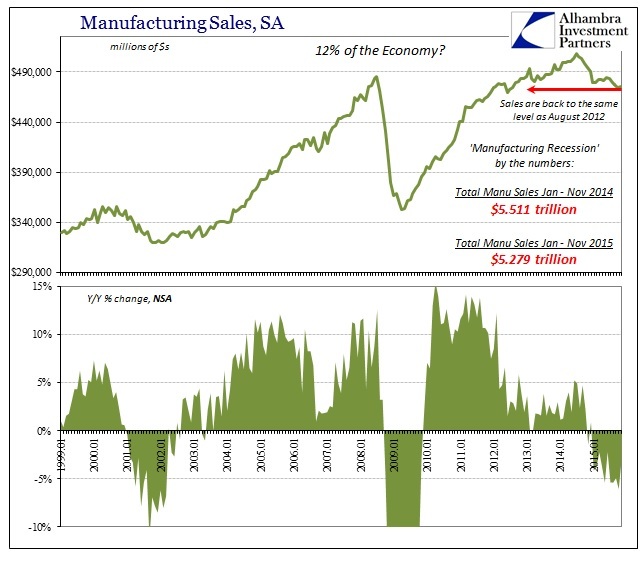 It’s not as if manufacturers and imports have been robust to build that much inventory; production is already in clear recession. The only way to equalize is to force even greater production cuts, which is why I think we are starting to get the hints of full-blown recessionary forces. As those wisps of suggestion penetrate further into financial markets, the less likely holdouts awaiting Janet Yellen’s version will be able to do so. That seems to have been the economic theme in manufacturing for the past year, so it is unlikely to be repeated this one. 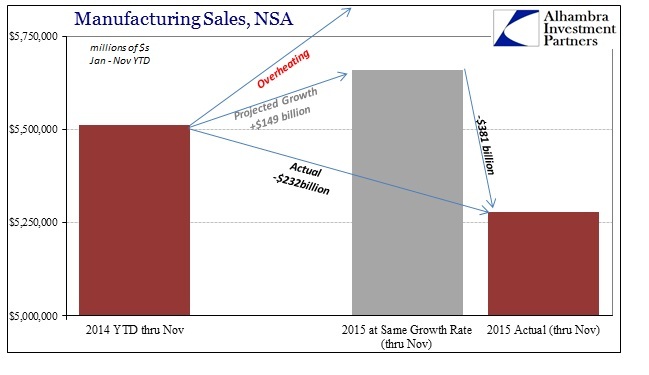 In terms of manufacturing sales, for the year (through November) sales are off about 4.2%. But even -4% or so is equivalent to about a $400 billion hole.